The final headlining event was billed as Houston’s Ultimate Literary Showdown. It must be said—this showdown rivaled the title fight between Manny Pacquiao and Floyd Mayweather that was also happening that night. Moreover, what was on the line was even more important than a title belt. 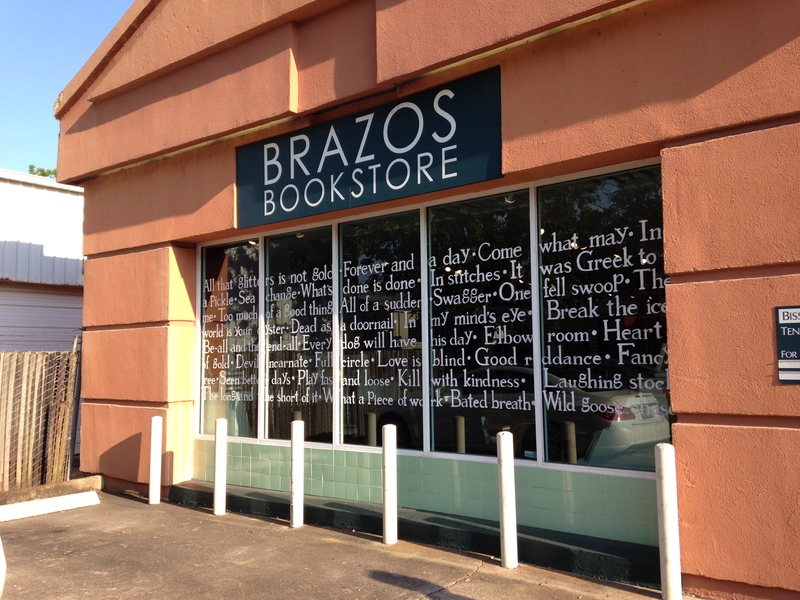 Brazos pledged to donate $300 to the winning author’s charity of choice. 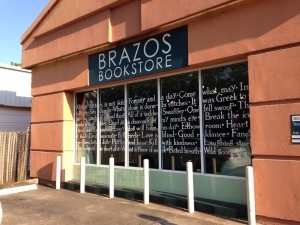 These good causes included Books Between Kids, Rice Veterans in Business Association, the Asian American Writers’ Workshop, and the Literacy Council of Fort Bend. 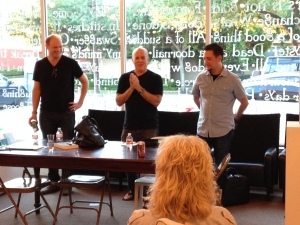 The final headlining event was billed as Houston’s Ultimate Literary Showdown. It must be said—this showdown rivaled the title fight between Manny Pacquiao and Floyd Mayweather that was also happening that night. Moreover, what was on the line was even more important than a title belt. Competitors had 30 minutes to complete a story based on a hitherto unknown prompt. Benjamin Rybeck, Brazos’s events coordinator, chose a cheeky passage from a romance novel. The certified Harlequin wove a web of intrigue, including a hero in a tux “barreling down the highway,” a crooked senator, a Porsche, a longed-for horse, and chiseled good looks all around. 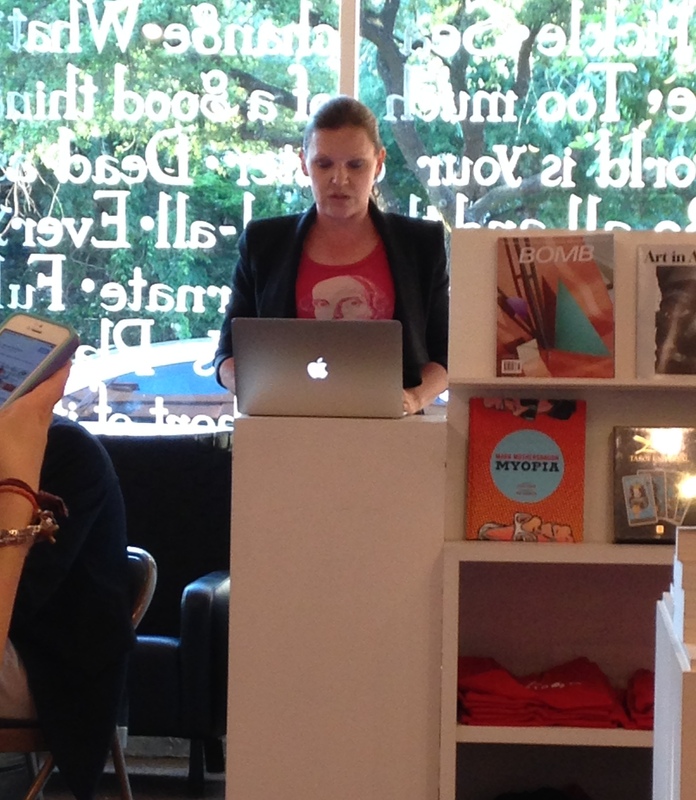 While the writers typed on their laptops—lo! one scribbled in longhand on a yellow legal pad—with looks of consternation, about 35 guests chatted, browsed books, and sipped beer from St. Arnold and wine from Beviamo. Soon, we were all assembled, and the judges introduced. The panel consisted of Rich Levy of Inprint, Giuseppe Taurino, assistant director of the University of Houston’s graduate program in creative writing, and Michael Hardy, former arts editor of Houstonia. The first intrepid reader, Chris Cander, author of Whisper Hollow, wove together a King Learian tale of a “cotton enterprise.” Her story was, appropriately, soaked in Southern details. There were Stetson hats and two-step dancing, an antagonist named Bubba and a protagonist wanted to be, not the next leader of the agricultural empire, but…a poet. As someone who battled very similar circumstances, though dissimilar in nearly every detail, I thought my allegiances would remain with this story. But each subsequent reading was equally imaginative. In a sheer coincidence, the next reader’s first sentence included the word “stud.” Ann Weisgarber, author of The Promise, whipped up a tale that was less about equine physique, and more about “country clubs,” “socialites,” “charities,” and “perfumed bosoms.” Set in the Panhandle, the story journeyed wholeheartedly into the romance genre, complete with a changing of a will as a major plot point. With such offerings, I’m sure glad that I was not in the judge’s seat. After some deliberations, Rich Levy made the announcement. He extoled the virtues of “the unexpected” and his belief that “humor is an underrated quality in literature.” The winner of the contest was Salesses. The champ was delighted to win money for the Asian-American Writers’ Workshop, a cause he told me that he really believes in. With stories like these, I’m already looking forward to next year’s hijinks. 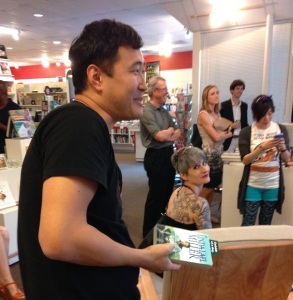 Of course, every day is a good day to celebrate your local independent bookstore, where you can get inspired and come into contact with the unexpected.